What every well-curated cookbook library should have is several go-to cookbooks for reliability, a few armchair (or nightstand) varieties for pleasure, and a smattering of teaching cookbooks for reference when you’re in need of some pointers. 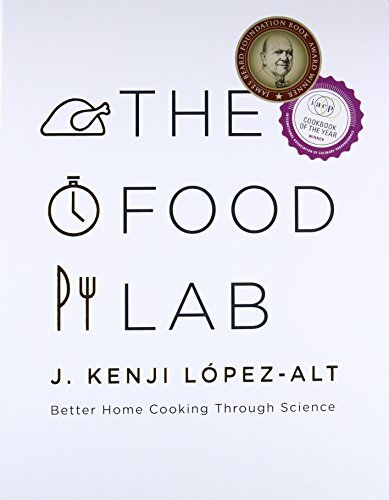 Weighing in at 6.6 pounds and 938 pages, The Food Lab by J. Kenji López-Alt fits firmly in this last category. It is a seminal work that is encyclopedic in scope and can be used as a reference by even the most experienced home cooks. A former M.I.T. student and self-described nerd, Kenji López-Alt hung up his lab coat in favor of an apron and began to apply science in the kitchen. Ultimately he developed the award-winning food column, “The Food Lab,” for the online food magazine, SeriousEats.com. As you would expect from a teaching cookbook, you will first be given a lesson on essential kitchen equipment followed by lessons that begin with how to cook eggs perfectly every time and ends with how to master frying. What you will not find is lessons on baking. But first, for those among us for whom the word science makes our eyes glaze over you will have to have faith that with the subtitle Better Home Cooking Through Science this book will work for you. Good cooking is the result of good technique. What Mr. López-Alt is doing in The Food Lab is using science (i.e. what is going on during the cooking process) to come up with better techniques. The good doctor then proceeds to explain these applications in just a few short pages followed by many pages of traditional French recipes accompanied by some of the most charming avuncular advice to the home cook that has ever been written. But whereas Dr. de Pomiane used science to support traditional cooking methods, Mr. López-Alt uses it to upend them. Everyone seems to have an opinion about how to cook a hard-boiled egg: bring the egg and water to a boil together and continue cooking for seven minutes; plunge the egg in already boiling water, take off the heat, and let sit for eleven minutes, etc. Yet if you get nothing more out of The Food Lab than how to cook a hard-boiled egg, it is just about worth the price of the book (considering how many hard-boiled eggs we cook in a lifetime). He is not kidding when he refers to this method as “foolproof.” Not only does the egg peel perfectly, but the yolk is done to a golden rather than a pale yellow and the white has a quality like none you have ever seen. The surface is silky smooth, and it is not quite fully opaque—at least not in the way you are used to observing opaqueness. You will never cook a hard-boiled egg using the traditional method again. Think about it, if you can win hearts and minds with a simple hard-boiled egg, then The Food Lab is nothing short of a game-changer. Yet before you think The Food Lab is going to turn you into a better cook overnight, consider this: Kenji López-Alt emphasizes temperature to gauge doneness and heavily promotes the use of the Splash-Proof Super-Fast Thermapen instant-read thermometer by ThermoWorks both in his “Serious Eats” column and The Food Lab. It’s a great tool, no question. But what is often lacking in The Food Lab recipes is cooking time estimates, so you can easily get tripped up. (If you don’t know how quickly a steak can go from 105° [rare] to 130° [medium rare] you might initially overcook your meat when relying on the Thermapen.) Time estimates would help a lot. In the meantime, you will have to do some experimenting of your own. Still, The Food Lab is an impressive teaching resource for both novice and experienced home cooks. Just remember that science alone cannot turn you into a better cook. Practice still makes perfect.